Continuing Panel Borders' month of shows about anthropomorphic comics, Alex Fitch talks to Teenage Mutant Ninja Turtles co-creator Kevin Eastman, Rich Magallanes (Senior Vice President, Nickelodeon animation) and British comic book writer David Baillie about the ever popular franchise. Alex discusses the history of the comics and cartoons with Kevin and Rich as well as the latest versions of the characters appearing in IDW's new comic book and Nickolodeon's forthcoming series. Alex and David talk about the latter's experience in writing TMNT strips for the Eastern European market, in the form of two page comics that look at the point of view of both the Turtles and the villains from the series. To complement this month's series of Panel Borders on anthropomorphic comic books, tonight's Clear Spot explores the use of animal characters with human characteristics in literature. 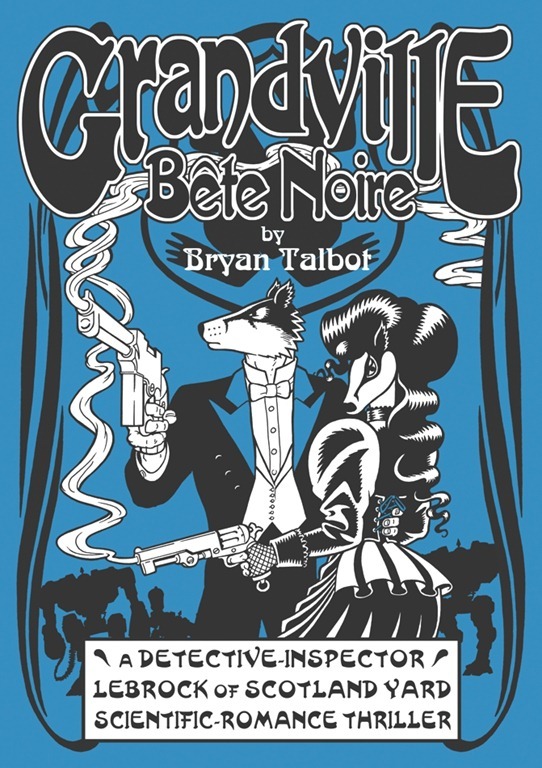 In the first half of the show, we're proud to present an extract from one of Bryan Talbot's lectures on anthropomorphism in children's books, cartoons and comics, and their relevance to his own graphic novels series Grandville. Alex Fitch also talks to Bryan about his interest in the subject, and to children's writer and illustrator Helen Ward about her adaptations of Aesop's Fables for modern audiences. Despite the number of comics shops in places like Lancaster, Middlesbrough, Newcastle-Upon-Tyne and Carlisle, the north of England seems to have few comics events. 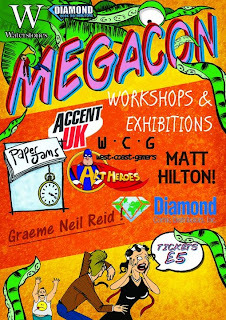 This is starting to be addressed at a local level with Newcastle's one day library-based Canny Comic Con in December 2011 and now Carlisle's half day MegaCon next weekend, showing that local comics fans do not need American guests or enormous London venues to enjoy themselves. Levi McGlinchey, Owen Michael Johnson and Graham Barke are members of staff at the Waterstones bookshop in Carlisle city centre and are organising the Carlisle MegaCon event due to take place in the Richard Rose Central Academy on Saturday 18 August 2012. Guests scheduled to be there include artists Sean Phillips and Graeme Neil Reid, writers Jim Alexander, Andy Diggle and Gordon Rennie, and local crime and horror novelist Matt Hilton. Jeremy Briggs spoke to the organising team about the event. DTT: As booksellers in the Carlisle branch of Waterstones, what books do you stock in your graphic novel and manga sections and which of them are good sellers in your store? MegaCon Team: At Waterstones Carlisle we sell a wide range of main stream superhero titles, independent graphic novels and manga as well as the usual staples of science fiction, fantasy and related product. We have a huge market for manga in Carlisle, as such our store has one of the largest manga sections in the company! Umbrella Academy is one of our bestselling titles that appeals to a wide market, both our manga and teen customers. Characters such as Batman always sell well, Arkam Asylum, Year One and Long Halloween being the biggest. Comic book movies of recent years have brought both an influx of new readers and massive interest in those characters. In short, the nerd army of Carlisle has been very kind to us, that is one of the reasons we mounted Megacon! DTT: Knowing what the local comics fans purchase from the store, how did that influence your choices of guests, dealers and the talks or workshops due to take place during MegaCon? MegaCon: The tastes of our regular customers vary, but the unifying theme is genre books with a dark edge to them such as Vertigo. Those customers also prefer material not concerning superheroes. Our independent titles do well, which is why we are interested in hosting graphic novelists who practice both mainstream books and creator owned work. We have a huge growing trading card market in Carlisle. We are one of the top two stores in the company championing trading card games. To cater to this need in Carlisle we have decided to start holding trading card tournaments, and have such invited Konami along to MegaCon and providing areas for both Yu Gi Oh and Magic the Gathering players. DTT: Having run smaller events in-store in previous years, why did you decide to expand this year and how did you end up using a local school? MegaCon: MegaCon was previously ReCon in our store. We have held ReCon for a number of years in conjunction with Diamond Publishing (previously Tokyo Pop). Our ReCon audience has grown far beyond our shop capacity, so this year we decided to take the leap and take ReCon to the next level. Our branch of Waterstones has used Richard Rose as a venue for author events in the past. We loved the atmosphere and vibe of the place so much we though it would be the perfect place for a Con. The main atrium of Richard Rose is such an interesting and unique space and lends itself perfectly to such a fun large scale event. DTT: You have a diverse selection of guests from comic artists and writers as well as local novelist. Was it a deliberate plan to get as wide a selection of creators as possible? MegaCon: MegaCon is also a community project. We chose specifically local creators as a means of showcasing incredible talent form the North West. We hope that this inspires other artists, writers, and creators/nerds to be more active. This is the first event of its size and type in Cumbria's history, so we have tried to make the event as accessible and interesting to the widest audience possible. The diverse programme of competitions, tournaments and workshops should satisfy not just die-hard comic fans, but also gamers, cosplayers, collectors and casual fans of popular culture in general. We each grew up loving cult entertainment but felt isolated in such a rural area. There was never an event unifying the tribes. We intend to get young people appreciating, and more importantly, making great art, be that comic or otherwise. DTT: Your selection of exhibitors/dealers seems to be a mixture of local businesses and local small pressers. Did you set out to have a good variety of stallholders or was it just the way it turned out? MegaCon: There are a lot of niche businesses in the area. We didn't have to go very far to fill all the spaces available, but once word got out we were holding a Con, the response was overwhelming and we had an army of local businesses and artists at our door wanting a space. Sadly we didn't have space for everyone that wanted a stall, but next year we hope to make MegaCon even bigger to accommodate more local dealers. 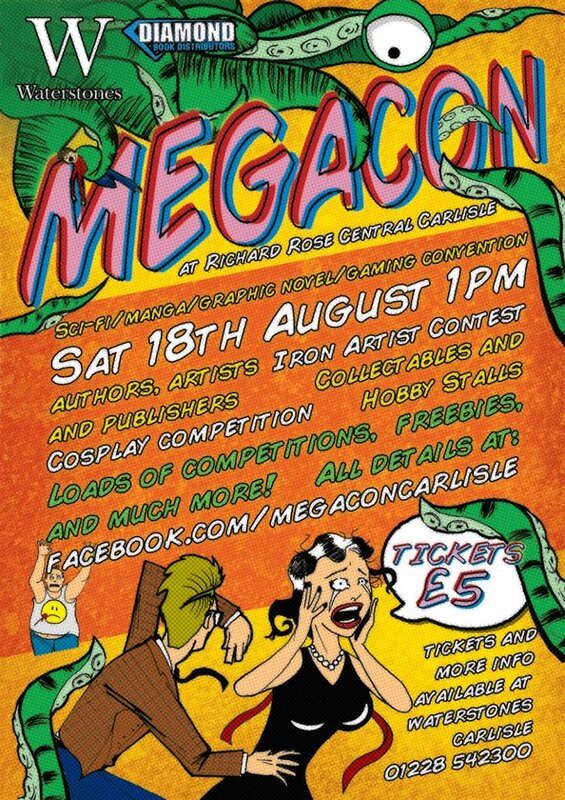 DTT: How will you gauge the success of the event and, if it is successful this year, could you see the Carlisle MegaCon becoming a regular event? MegaCon: It's our full intention to carry on in the tradition of ReCon and hold MegaCon annually. 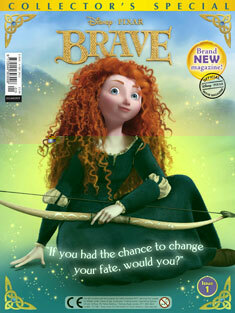 There is loads of budding comic book creators in the area, just itching to get started. 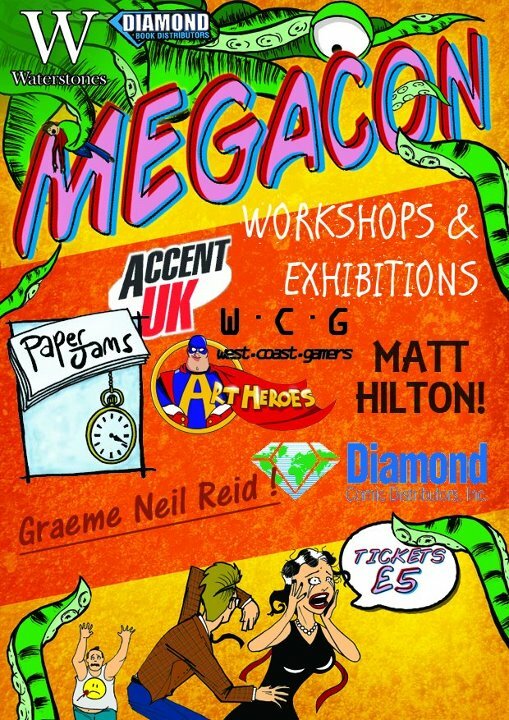 If MegaCon is incentive for just one to pick up a brush or pen and make great art, we as organisers will be thrilled. Equally, if our attendees - be they 30 or 300 in number, 4 or 94 in age - have had a great day, we will have succeeded in our goals. The long term vision for MegaCon is to build upon it year on year. We have had big industry names confirm they would be interested in being on the bill for next year, so we very much hope attendance justifies further expansion in the coming years. DTT: Thank-you all for taking the time to talk to us. 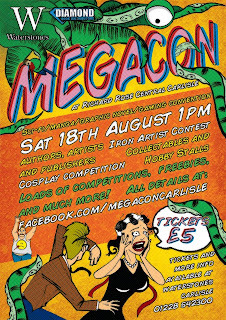 Carlisle MegaCon will take place on Saturday 18 August 2012 at the Richard Rose Central Academy on Victoria Place, Carlisle. Doors open at 1pm and the event will run until 6pm. Tickets cost £5 and are available in advance at the Carlisle branch of Waterstones in person on via the phone (01228 542300), as well as on the door on the day (subject to availability). The MegaCon organising team were out and about cosplaying in Carlisle city centre in July to publicise the event and were photographed by the Carlisle News and Star. Early issues of TV Century 21, Thunderbirds sweet cigarette cards, copies of Tornado, artwork by Don Lawrence, Ken Reid, John Bolton, Dudley Watkins and others are just some of the auction lots in the latest Compalcomics auction. The previous summer auction saw the sale of a lot of Eagle-related mechandise, including the sale of a Dan Dare bust from an edition of 20 for £550, while Dan’s tie-pin, Eagle penknife and Membership Card sold for £330. 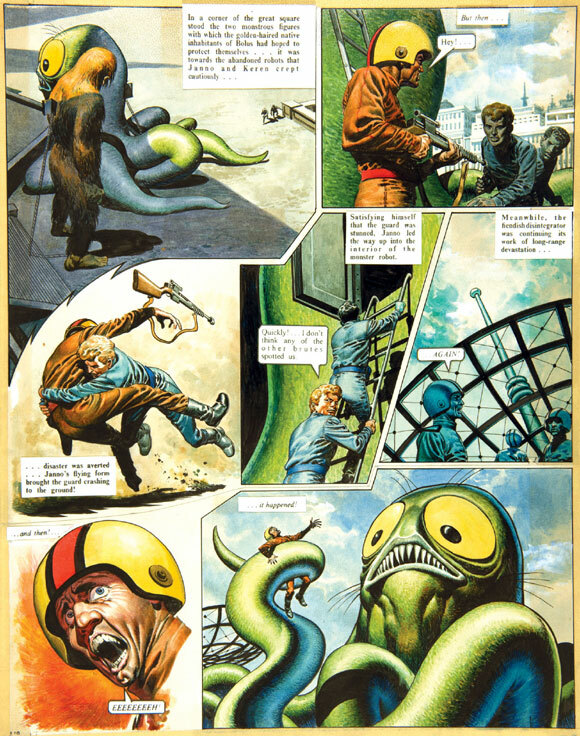 Other March catalogue highlights were Davy Law’s Beryl The Peril artwork from The Topper which sold £1222 and a copy of Tiger Number 1 with free gift Space Gun and Flying Saucers, published in 1954, selling for an interplanetary £935. There are more Eagle rarities in the latest auction including an Eagle promotional Number 1, Keith Watson’s original artwork of a darkly threatening Mekon and Desmond Walduck’s double pager of Anastasia sinking into the Venusian quicksands from Eagle Volume 9, Number 10. 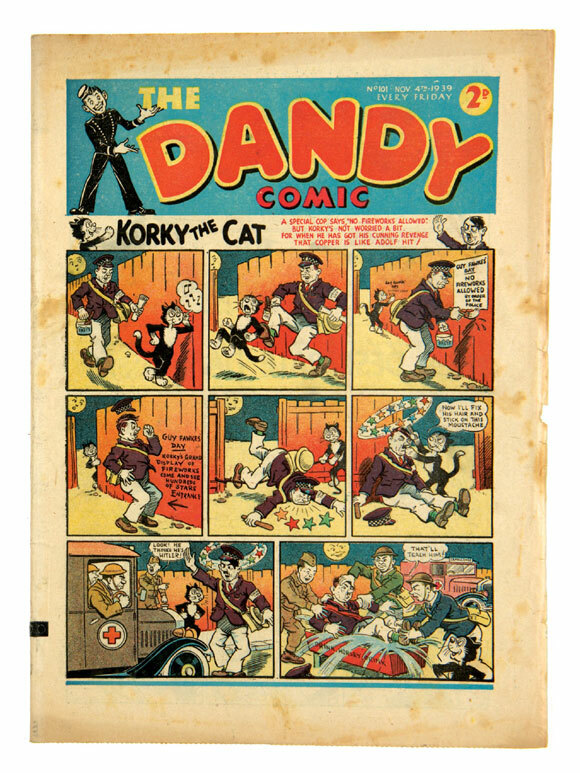 Early Dandy and Beano issues published during the second world war - considered very rare - are also up for grabs, along with titles such as Topper, Judy, Hurricane and Express Weekly and a copy of the first issue of Playhour Number 1, complete with free gift Red Indian Head-dress. (Make your reservation). 10 individual issues of TV Century 21 are on offer, too, the first issue complete with the all-important Top Secret Decoder free gift. Artwork on offer include a page of The Trigan Empire by Don Lawrence; Faceache by Ken Reid; The Bionic Woman by John Bolton, published in Look-In; and Terry Wakefield’s five-page artwork of Morecambe And Wise from Eric And Ernie’s TV Fun Book. There are US comics on sale too, including DC Comics Showcase #22 and 23, Green Lantern #1-137 and Jimmy Olsen #1-163 along with Marvel Comics Avengers #1, X-Men #94 and Giant Size #1. • View the auction here. Bidding closes on Tuesday 4th September at 8.00pm UK time. 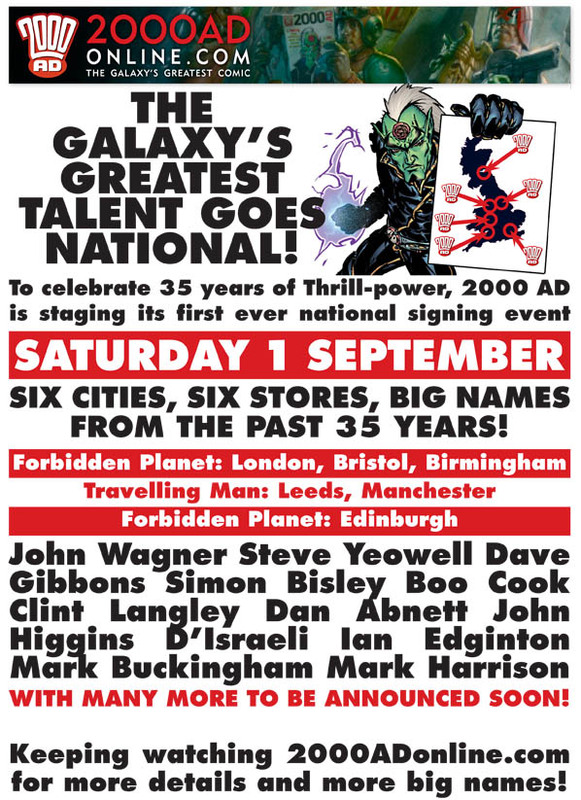 Following-on from the announcement last week of the first ever 2000AD National Signing Event, Rebellion have announced even more big names taking part – and the addition of a signing at Forbidden Planet in Belfast. To mark 35 years of the Galaxy’s Greatest Comic, on 1st September artists and writers from the past three and a half decades of Thrill-power will be descending on comic book stores nationwide. 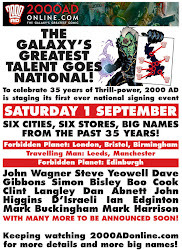 The venues are the Forbidden Planet stores in London, Bristol and Birmingham, Travelling Man stores in Leeds and Manchester, and Forbidden Planet stores in Edinburgh and Belfast. 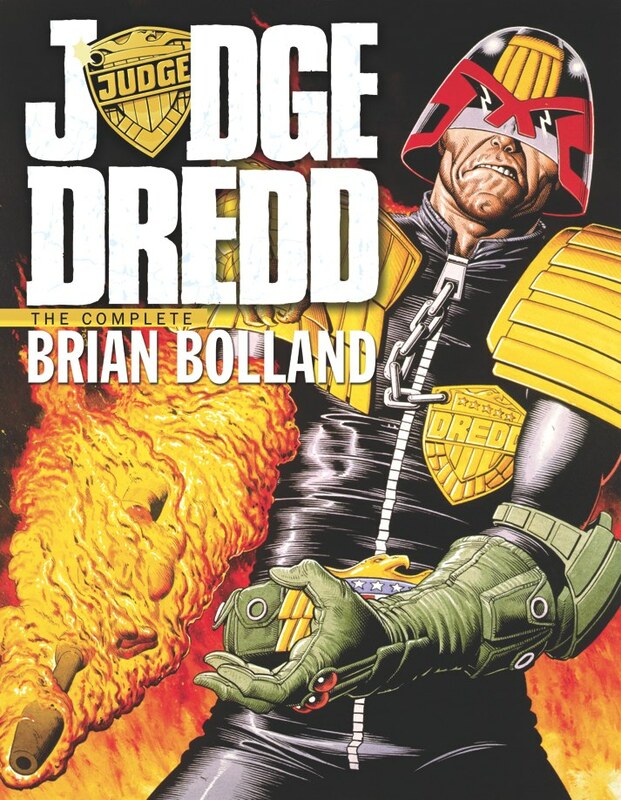 Less than a week before DREDD 3D hits movie screens across the UK, Dredd co-creator John Wagner will be signing at Travelling Man in Manchester, while we are very pleased to unveil the signing at Forbidden Planet in Belfast with Judge Dredd writer Mike Carroll and artist PJ Holden. 35 years of Thrill-power, one zarjaz day! Labels: 2000AD, DREDD 3D, Events, John Wagner, Mike Carroll, PJ Holden. Comic Fans, TV fans, film fans - you're being studied! European Fandom and Fan Studies, a one day symposium, will take place on 10th November 2012 at the Amsterdam School for Cultural Analysis and University of Amsterdam Department of Media Studies - and they have just issued their "Call for Papers". The symposium will be held in the centre of Amsterdam, easily accessible from Amsterdam international airport. Fan Studies is growing but primarily focused in North America. This one day symposium at the University of Amsterdam seeks to explore the state of Fan Studies and the variety of Fandoms focussed within the broader social and geographical boundaries of Europe. Inter-disciplinary papers are invited to explore the nature of the field itself or how different fandoms function within Europe. Potential avenues of exploration may include how Fan Studies is represented, studied, and received within European universities, by funding bodies and publishers. Papers on Fandoms may explore how European (English and non-English speaking) fans of European and non-European objects of fan appreciation participate in fandom, the differences between internet fandoms and local/national/international fan practices, and the different objects of fan appreciation. The symposium is associated with a special issue of the Journal of Transformative Works and Cultures tentatively slated for 2015, with full papers due 1st January, 2014 (now that's what I call planning ahead). Transformative Works and Cultures is an international, peer-reviewed journal published by the Organization for Transformative Works. TWC publishes articles about transformative works, broadly conceived; articles about media studies; and articles about the fan community. Aside from this planned project, the organisation has a general invite for papers in all areas, including fan fiction, fan vids, film, TV, anime, comic books, fan community, video games, and machinima. Growing up in Malaya, young Sam Logan dreamed of being a pilot. He volunteered for the RAF as soon as war broke out -- only to be washed out of flying training thanks to the dizziness that overcame him every time he took to the air. He ended up on an RAF Air-Sea Rescue Launch, patrolling the choppy grey waters of the Channel. Almost as much as he did himself, Sam’s crewmates wondered if the reluctant sailor was up to this dangerous work. 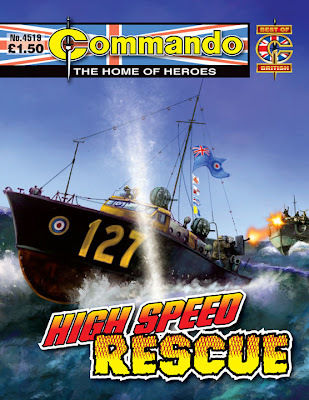 Their very survival depended on him working as part of a team... especially when there were E-boats on the prowl. Ken Kluger, son of a Japanese mother and a German father, had attended university in England and was fluent in all three languages. When war broke out, though, he ended up working for the British as a translator and code-breaker. Soon, however, he found himself involved in much more dangerous work. He became part of a perilous plan was to use a captured German submarine -- holding a lethal secret weapon -- to destroy an enemy U-boat pen and stop a deadly attack! Just another routine patrol, just another empty village in the Burmese jungle. Nothing to fear, every hut silent, deserted, no movement in the shadows, no sound on the still, sultry air. Everything calm and peaceful. Why then did fingers tighten nervously on triggers, why did the cold sweat of fear break out on every man’s brow? It was as if some sixth sense was telling them of terrible danger, of a fiendish trap waiting to be sprung. It only needed one man to see the sudden glint of death in a darkened doorway, to scream a warning... a warning that came too late! 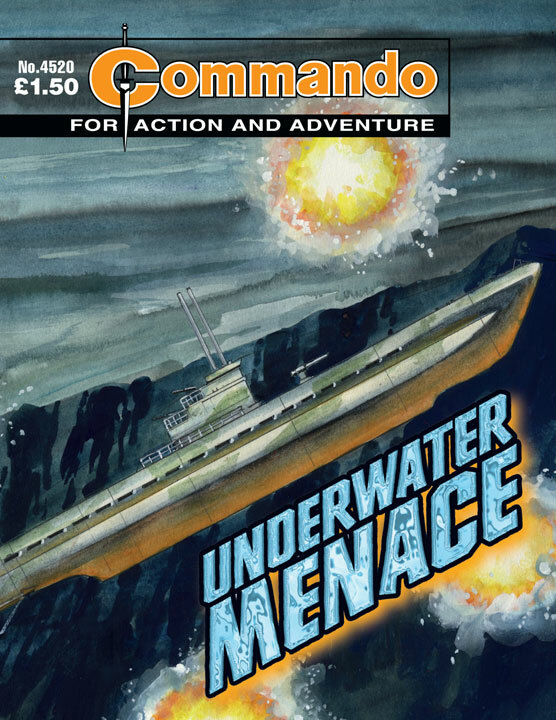 "I hope nobody minds that we’ve slipped back into 1961 for this story,” says Calum Laird, Commando Editor, “making it 51 years old instead of just 50. Once you’ve read it you’ll see why we didn’t want to let this one get away. A fortune-teller’s prophecy, good friends at each other’s throats and the constant menace of death without warning. Oh, and a twist in the tail. 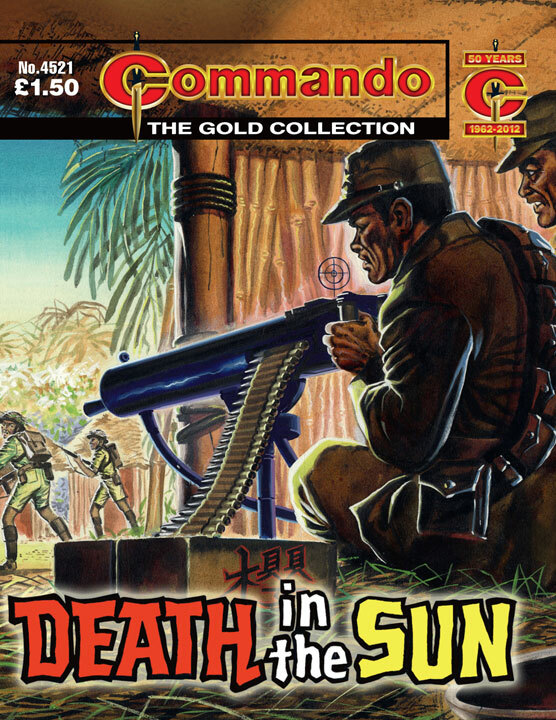 This is classic Commando fare. “Once you’ve opened Ken Barr’s menacing cover, Garcia’s art is full of action -- check out page 11 for just one -- pushing the story forward at a breathless pace. By nineteen-forty-four Allied pilots saw the Junkers 87 as an easy kill. Too slow and sluggish, they said, to pose a threat. But Colonel Otto von Arne had plans for his aircraft. By adding rockets to assist take-off and extra machine guns for defence, he made sure that once again his squadron was a force to be reckoned with -- especially when they were also armed with powerful 37mm guns. 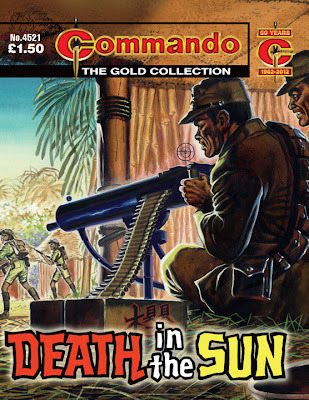 “Commando is often dismissed -- usually by people who haven’t read it for decades -- as being full of cardboard cut-out characters who only bark clichés like ‘For you the war is over!’” notes Commando Deputy Editor Scott Montgomery. 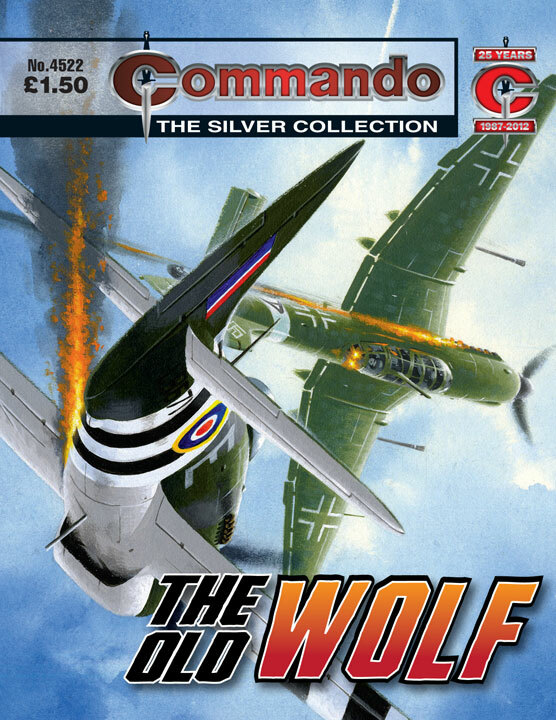 “German characters, in particular, are too easily stereotyped like this so let’s meet Colonel Otto von Arne -- AKA ‘The Old Wolf’. The Royal Edinburgh Military Tattoo has been running in Scotland's capital annually since 1950 and was upgraded to Royal status in 2010. As part of the greater Edinburgh Festival, the Tattoo takes place in the open air high above Edinburgh on the Castle Esplanade seven times a week between 3 and 25 August 2012 with upwards of 1000 performers displaying to an audience of around 10,000 people for each performance. Since 2005 the Tattoo has included a 'son et lumiere' backdrop using the walls and ramparts of Edinburgh Castle itself to project massive images on. These have often covered military subjects and this year included a tribute to the fallen with images of poppies and the inscription from the Tomb of the Unknown Warrior in London's Westminster Abbey. So the displaying of a "KAPPOW" comic sound effect was something of a change of pace for the Tattoo as images of generic American-style superheroes were projected onto the Castle. Amongst the massed military bands and selected civilian bands and dancers at this year's Tattoo, the band of the United States Naval Forces Europe performed a selection of musical themes from superhero television series and films described by the Tattoo as "highlighting the external battle between good and evil". These were not all spandex clad superheroes as the audience appreciated a US Navy band appropriately playing the theme to the Popeye The Sailor cartoons while local British characters of Dennis The Menace, Minnie The Minx, Bananaman, the Broons and Oor Wullie were projected on the Castle with the full permission of DC Thomson as two performers dressed as Dennis and Minnie menaced the band on BMX bicycles. The band, as with many of the other bands on display, marched and moved into different formations during their performance. As the music changed to both the Main Theme and Can You Read My Mind? from 1978's Superman The Movie, the band moved into Superman's 'S' emblem as the image on the Castle walls changed to a Superman-style character sporting the Royal Standard Of Scotland's Lion Rampant on his chest. The Royal Edinburgh Military Tattoo takes place between 3 and 25 August 2012 and there are more details of the event and the opportunity to purchase the remaining tickets at the Tattoo website. The BBC will be broadcasting a recorded version of the event later in August 2012. It’s been the cutting edge powerhouse of British comics since 1977 – and now 2000AD is celebrating 35 years of Thrill-power with its first ever National Signing Event. Just days before DREDD 3D hits movie screens, on Saturday 1st September, six comic book stores in six cities from north to south will play host to a band, nay, a legion of top British comic book talent from the past three and a half decades. From old hands such as Dave Gibbons Simon Bisley to the newest finds such as Al Ewing and Alec Worley, 2000AD will be celebrating Britain’s greatest export across the nation. 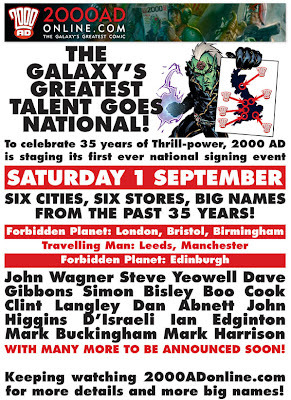 Forbidden Planet stores in London, Bristol, and Birmingham, along with Travelling Man stores in Leeds and Manchester, and the Forbidden Planet store in Edinburgh will be stuffed with artists and writers who have made 2000AD what it is today. Legendary writer, and Dredd and Strontium Dog co-creator, John Wagner will be headlining the day with a visit to Manchester and other big names now confirmed include Dave Gibbons (Rogue Trooper, Watchmen), Simon Bisley (Sláine: The Horned God, Lobo), Steve Yeowell (Zenith), Clint Langley (Sláine, ABC Warriors) Dan Abnett (Sinister Dexter, Kingdom), John Higgins (Judge Dredd), D’Israeli (Leviathan), Ian Edginton (Leviathan, Red Seas), and Mark Buckingham (Fables). 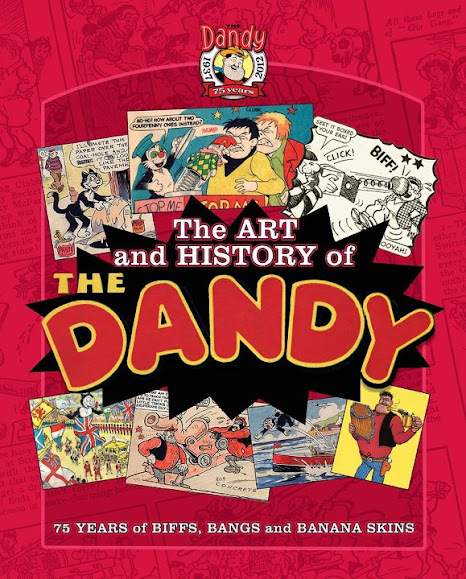 The Book: A chronicle of 75 years of the world's longest-running comic, The Art and History of The Dandy is a beautiful gift book and treasury of everything that has made The Dandy so anarchic and special. The Review: With such a rich history, documenting the story of the world's longest-running comic, even with access to DC Thomson's archives, must have been no easy task - but for me, a casual Dandy reader, former editor Morris Heggie pulls off this herculean task with aplomb. 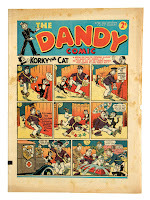 The Dandy is a record breaker: in 1999 it became the world's longest running comic and this reasonably-priced hardback book comes packed with stories of how its characters -- Desperate Dan, Korky the Cat, Beryl the Peril, Keyhole Kate, Brassneck, Winker Watson and many more -- came to be, along with profiles of its numerous creators from its origins to its troubled present. 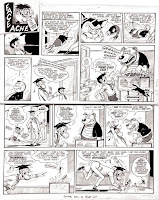 For those who don't know, The Dandy, DC Thomson's first weekly comic, hit the streets on 3rd December, 1937, six months before its sister comic The Beano. The intent - stymied by the Second World War, whose paper rationing could so easily have put paid to the comics and indeed, meant a fellow title, Magic Comic, was short-lived - was to create a 'Big Five' of humour titles. This would, original editor Alfred Barnes believed, echo the success of DC Thomson's 'Big Five' of adventure comics - Adventure, The Rover, The Wizard, The Skipper and The Hotspur. Ledgers of the comic's sales (which I've been lucky enough to have seen during one visit to the DC Thomson offices) document the title's early success, quickly out-selling adventure titles as Britain battled its way out of economic depression and prepared for War. Telling the story of the comic chronlogically, breaking down its history into eight sections from its origins and huge success to its difficult present, beset by competition from many quarters, The Art and History of the Dandy is a glorious read, albeit tinged with the sad truth that its glory days are, perhaps long behind it. And yet, while the title's past success - in the 1950s, it was the world's largest-selling comic with a circulation of around two million copies a week - is without question, there are some who do challenge more recent attempts to breathe new life into the title, the comic's older fans perhaps forgetting it is aimed at children, not 40-something fans with rose-tinted memories of childhood. Indeed. 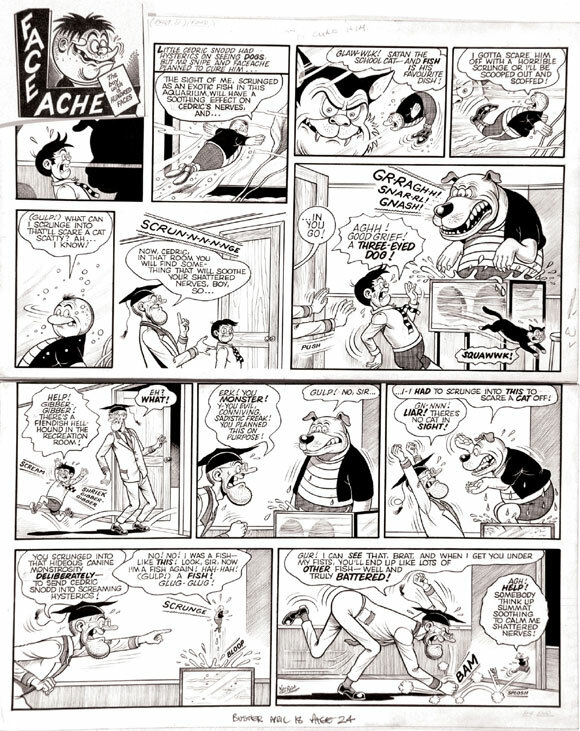 The Art and History of The Dandy tells the story not just of the comic, but how changing society, frowning on some aspects of its very nature, have affected and changed the style of its storytelling, with characters such as Bully Beef considered politically incorrect today, despite the fact that the vile character regularly got his comeuppance. (Barnes was also behind Desperate Dan, who became The Dandy's biggest star). Whatever the future of The Dandy - and indeed other non-licensed, original and long-running titles such as The Beano, Commando and 2000AD - The Art and History of The Dandy is a hugely enjoyable read, albeit strong on the earlier history of the title but perhaps less revealing on its current state. If you grew up reading the comic, or are a fan of British comics, Desperate Dan, Korky the Cat, Bananaman (and many other great creations by the likes of Dudley Watkins, Ken Reid, Steve Bright et al) this title definitely deserves a place on your bookshelf. Sub-titled 75 Years of Biffs, Bangs and Bana Skins, The Art of The Dandy offers an amazing trip down memory lane for fans of The Dandy. Sumptuously illustrated (with some great behind-the-scenes imagery and cheeky notes), I really enjoyed reading this and I think many of our readers will, too.